Decomagazine – Industrial design: it’s a must! For many, industrial design is a necessary evil, but for others it is essential. Often, it is dismissed because it involves additional costs and is not essential for the operation of machine tools. Customers also neglect it because, in the popular imagination, it often involves costs without bringing any concrete improvement in performance. Decomag met Enrique Luis Sardi, director of Sardi Innovation and designer of the MultiSwiss, EvoDECO 32 and BA 1008 machines, which will be on show at EMO, to discuss this subject. decomagazine: Mr Sardi, what is your role as designer? Enrique Luis Sardi: Design is often neglected within the industry, however it is a key differentiator which can bring real economic benefit. Innovation through design will bring you real added value compared to your competitors, and will also strengthen your brand image. We offer much more than design at our company: We are a team set up to offer innovation and bring new, iconoclastic ideas to entrepreneurs and large companies. We do not simply design beautiful machines, we support our customers in their search for solutions that ensure their product is more than just uniquely better, it is unique. Our mission is to turn crazy ideas into concrete, profitable business opportunities. We always have our eyes and ears open ; it is a constant quest and battle to keep a company at the cutting edge ; we need to plan the aesthetic innovation process almost two years in advance. The objects are simply the final realisation of this process. dm: Is ergonomics not more important than design in an industrial machine? ELS: Design and ergonomics are just two sides of one reality ; the design cannot precede the function, but it must be able to improve it as much as possible. 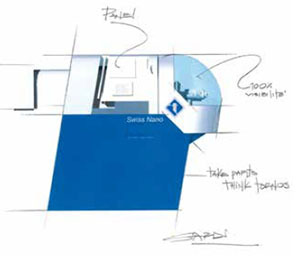 Take the SwissNano, for example : You have a unique product combined with a range of ergonomic functionalities, the most striking of which is the bubble giving the operator 180° access to the machining area. The control is on a pivoting arm ensuring perfect ergonomics during adjustment operations. The top of the enclosure houses a support allowing tools to be deposited on the top of the machine without falling or damaging the machine. The feeder is integrated inside the machine. These layout issues would not be possible without in-depth analysis of the product and its everyday use. But ergonomics does not prevent you from having an attractive design ; in fact, contrary to popular belief, a well though-out design often allows the manufacturing costs of the enclosure to be reduced. dm: How would you define your work? ELS: I have a unifying role. The projects I work on highlight the collective aspect of my work ; I balance the energies of my innovation group in Milan with the needs of our customers. My goal is to unite the project team around common values, to get past the stage of thinking « its not possible », to analyse each constraint to see whether they are actually necessary and, if they are, then to work with these constraints. Through my actions, I hope to lead both the team and the project towards the road to innovation. Design is hidden in the details and is fundamentally the result of teamwork. dm: You talked to us about the SwissNano, do you have any other projects in progress for Tornos? ELS: Yes. I would urge everyone at EMO to visit the new EvoDeco 32 and the new BA 1008 from Almac, and we are currently working on other machines that I am sure will delight customers.